Southern Hills Station is 90kms east of Norseman in Western Australia. For two years from 1919, Tom and Paula Scotland managed the property, along with three small children. They went on to have seven children, the eldest being Norah who writes here of her memories as a 6 year old. 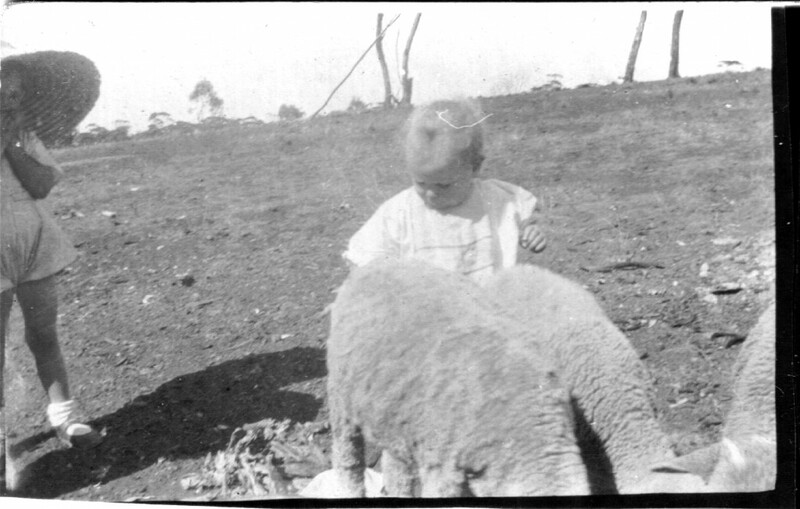 This is a series of photos taken at Southern Hills, of a family growing up, playing with the sheep and horses, and developing loving relationships with the indigenous people. As far as I can I have filled in the period after Mother’s return with me to Australia after the voyage on the ill-fated “Arabia” en route to show me to Father’s family in England. I think she believed he was to be sent to France. 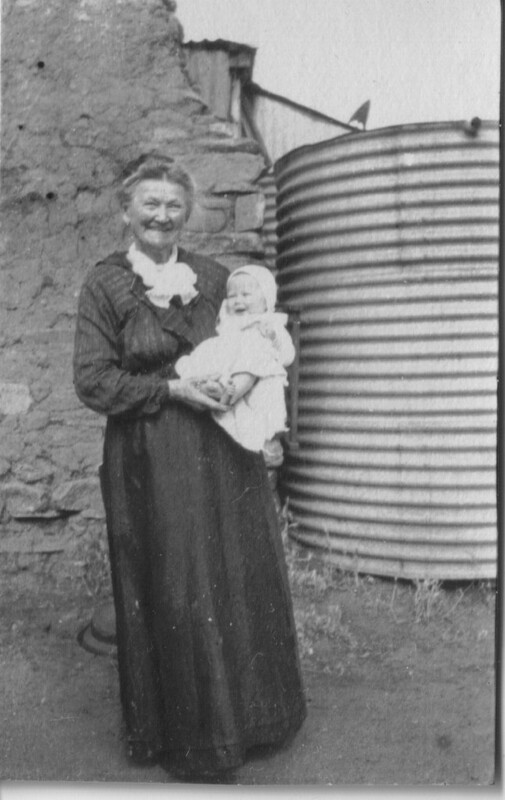 Mother lived in South Perth with me and perhaps Melita was born there. The image of Marjory King, Mother’s dear friend, who became Melita’s godmother, is strong (a forest of trousered legs, murmur of voices and passionfruit on saucers the only other impression – some socialising took place, viewed from under a table). 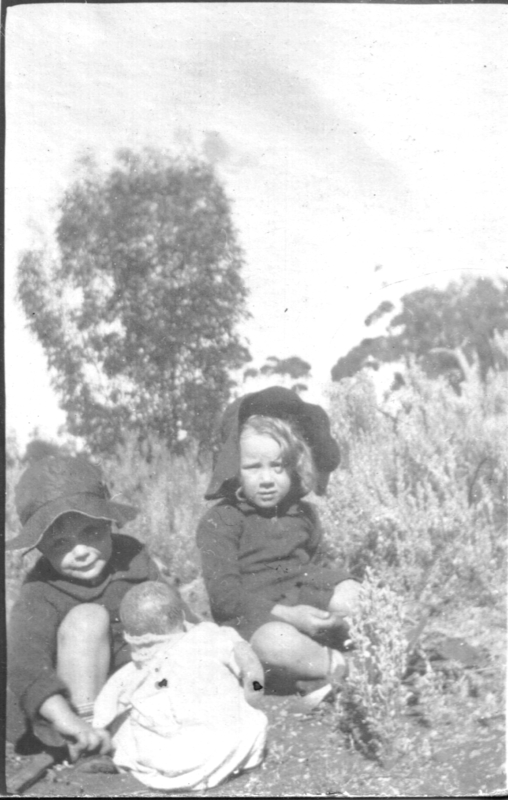 Melita was certainly present at Adelaide Terrace where we dwelt when Dad returned from the war. And where a splendid person visited – Uncle Will of the Royal Navy. He came into the fire-lit room to see me and the baby in our beds. He and I had already met on the banks of the Nile. Mother’s hair was done up in fine fashion. The pleased voices talked on as we fell asleep. Then Wongong (Wungong near Armadale) for a time – again the presence of Marjory King. Father would have been managing the property. An enormous pear tree at the door, blackberries lining the creek that passed close by the back door; the baby wearing “crawlers”, a walk with the baby in the pram, me carrying my doll. Pausing to rest a while, Auntie Marj sat on my doll. Shrieks of remonstration from me at her appalling insensitivity. My doll was a piece of board. Uncle Otto and Aunt Ida carried on from us when we left for “Moyallen”, which I think was near Katanning. Anyway, we were housed in a chaff shed at “Moyallen”. An area partitioned off contained a stove and a table. The beds were under the roof indeed but there were no walls, just fine nature all around. A sulky was parked in that area and a horse chumped (sic) contentedly on hay and chaff in a corner. No doubt Mother dreamed that too. There were some fowls. 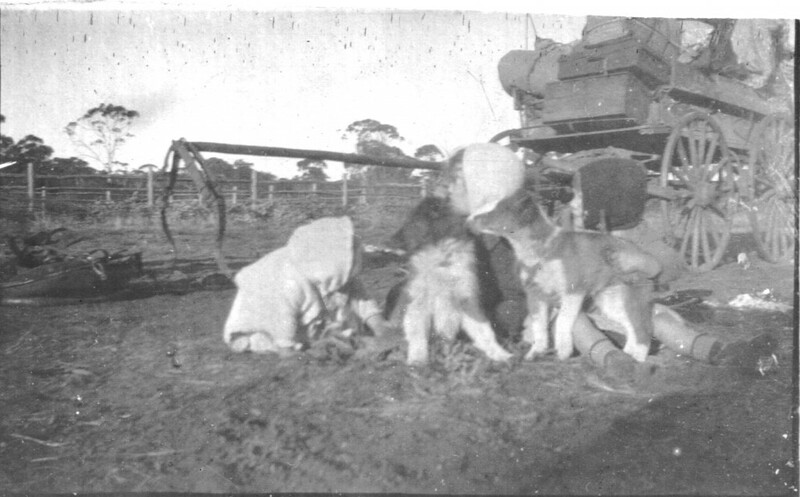 Once Mother took down the rifle, walked away a bit; came a loud crack and she returned holding a large goanna by the tail, which she draped over the fence, remarking it had been eating the eggs, and when she saw it perched up a tree it was an easy target. Well, she had been a crack shot with the Narrogin Rifle Club in her single days. We spent a Christmas there, with the most beautiful decorated tree we ever saw. Also, we stayed in the town, at least once; I went to a kindergarten. 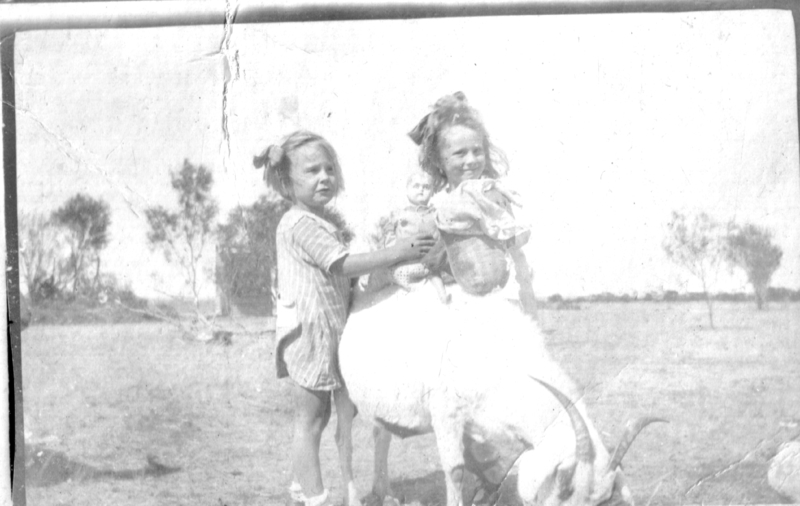 Perhaps Helen was born then, as I have an impression that Melita and I stayed with some people with a scary cow that suddenly came around the corner. 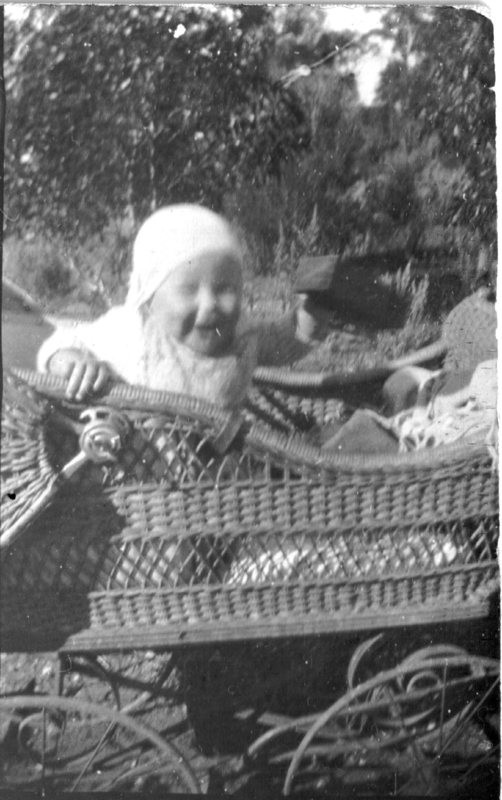 Helen was the baby in the pram at “Southern Hills”, 75 miles from Norseman where next we moved. 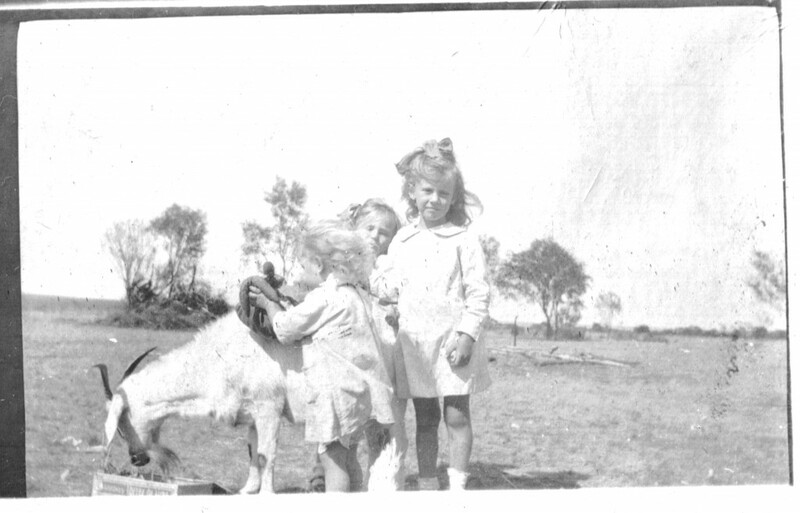 Or perhaps, awaiting the move we had gone back to Narrogin, to “Sylvania”, our sweet gentle grandmother’s home. From time to time we were there between changes of Dad’s employment, or with a dear aunt and uncle, some here, some there. “Southern Hills” was a sheep station. The home of the Manager was a mud building with immensely thick walls and an earth floor. Dolichus creeper grew to shelter the verandahs. The men whitewashed the walls. Father’s arms were pitted with lime burns. 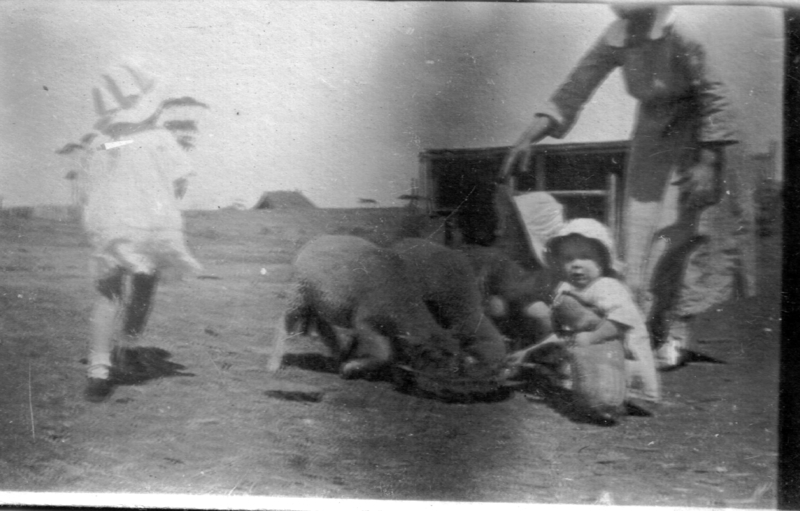 My remarkable Mother’s nursing training was often called on, as when Father cut his arm disembowelling a strung up sheep. He came into the house singing, gashed arm stretched out for Mother to doctor. Condy’s Crystals was the antiseptic in those days, the pink wound-washing water. Hot salt bags for my toothache, the saddest thing to happen on Christmas Day when I did not cease crying, were in fact a great comfort, also for earache, a warm pain absorbing pillow. 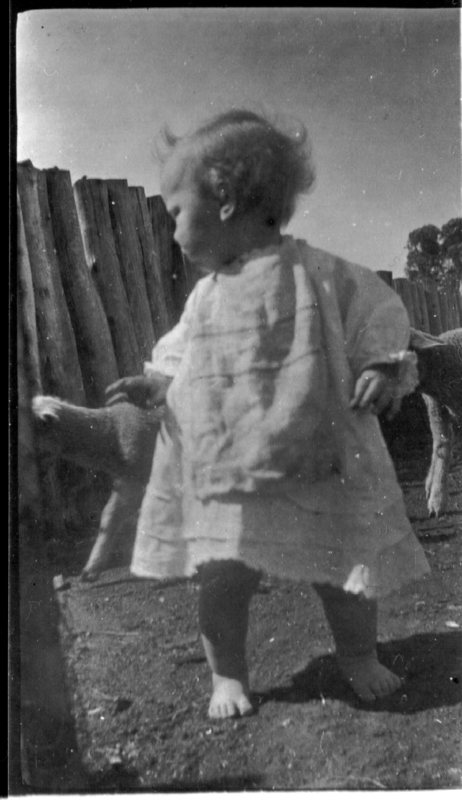 We had a nursemaid named Norah, I was told from a mission where she had been taken when her parents were killed. I wonder now who killed them. She walked the baby, Helen, in the pram, Melita and I in tow, and she took me riding. One time she suddenly dismounted, went into the bush and quite soon reappeared with a fat bardie which she kindly offered to me. She ate it with relish when I refused my share. At shearing time a cook named Charlie became lord of the kitchen. He punched bread dough in a big box, and did not like any one to enter his domain. Sometimes the Afghan camel train came with trinkets and fabrics to sell mysterious and wonderful. The camels chewed loftily, sat down and closed their eyes, arrogantly dismissing us from their sight. 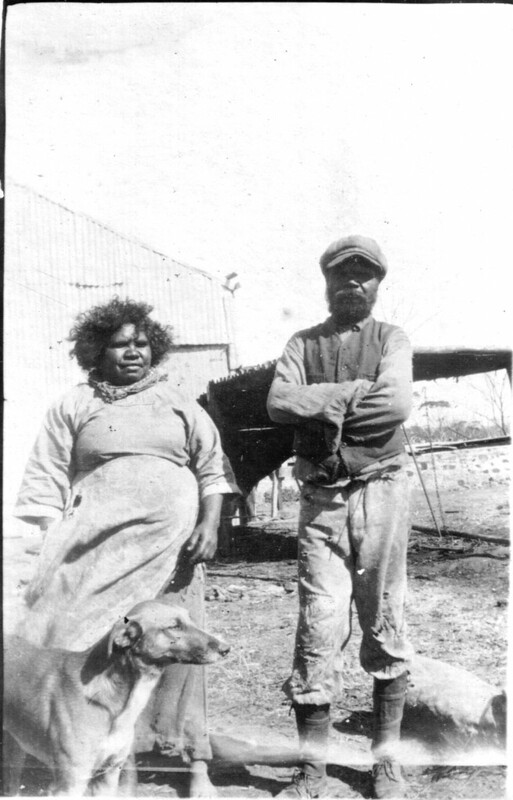 Mother was called to the stables to administer first aid to an aboriginal stockman who had been kicked by a horse. He sat on a box in the stable yard, eyes shut and head raised in patient suffering. I was immensely sad at the sight of the large crescent wound on his forehead. I think he was Norah’s boyfriend, or probably husband. Mother surely did need Norah. One bright morning Melita vanished. All turned out to search the bush, calling and calling her name for a time long enough for anxiety, and then the small child strolled out of the bush. We had a mountain devil for a pet, kept tied to a post by string near an ants’ nest where he thrived until he broke his tether and left. Our beloved Grossmama came to stay. She would have come by horse and wagon from Norseman. 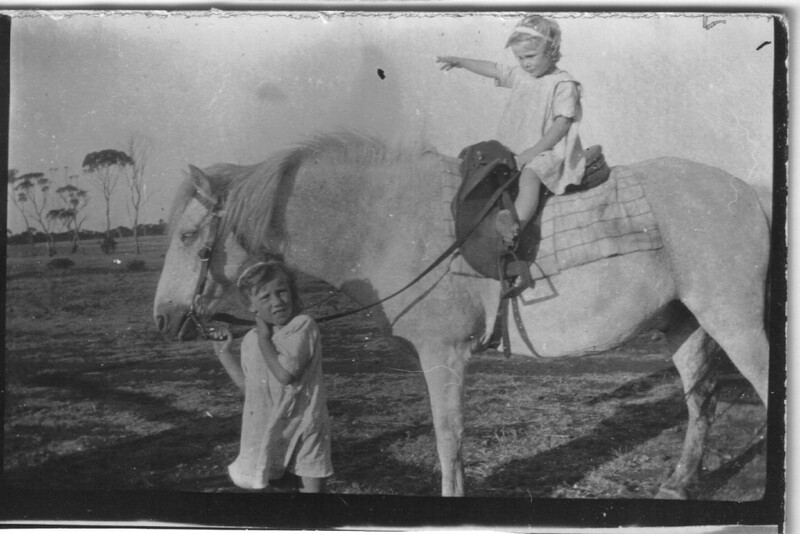 There was no other way except horseback. We played “ladies”, and she told us then we must rub geranium petals on our cheeks to make them pink. After a while it turned purple. Aborigines sat down a yard or two from the verandah. I found my chair and sat on the verandah regarding them. We looked at each in a soft brown silence, they looked at me and I looked at them, until gentle as a zephyr moves, they went to camp. Mother could not find her little silver scissors. We went to ask at the camp because she thought they might have taken the scissors. Only the ashes from their fire remained – they had disappeared as shadows do. 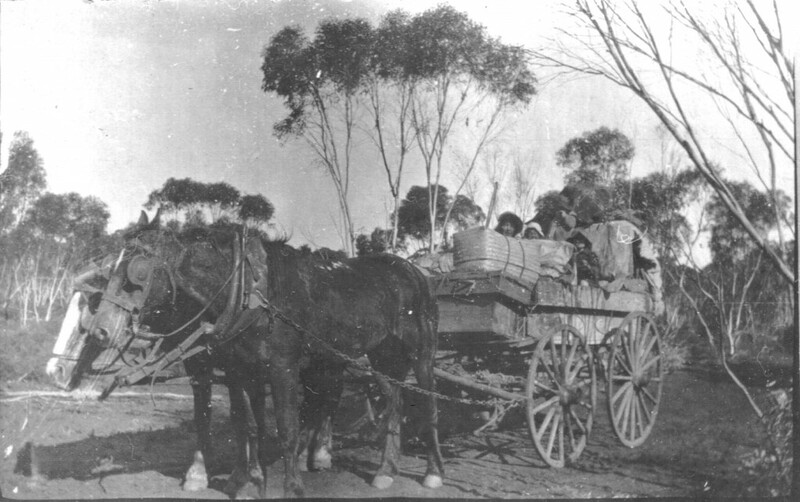 A journey to Norseman by wagon took several days and nights, beds under the wagon for Mother and children, the men slept in the open. According to an old snapshot there were several riders, one an Aborigine. Mother sat in style, sunshade up, amidst the provisions (loaves and fishes!). We stayed at the Norseman Hotel. In the morning a group of Aborigines sat a short distance from the hotel. Mother said they wanted to speak to her. She did not sit on the hard brown earth of the town in silent communion with them, and they did not stir. O, my brown friends. (No, she swept me off to the dentist. I disapproved her hauteur). Back we journeyed to “Southern Hills”. During one period of 12 months that we were there Mother said she did not see another white woman. Within walking distance of the house was a fine rock pool, to which we proceeded with Father in stately fashion, bather clad and towels over shoulders for the swim. But one day a drowned sheep floated in the pool, and I think that was that. Some time on, we landed at “Carnegie”, residence then of the Graham family, whether he leased, owned or managed the property, Uncle Will that is, someone will know. 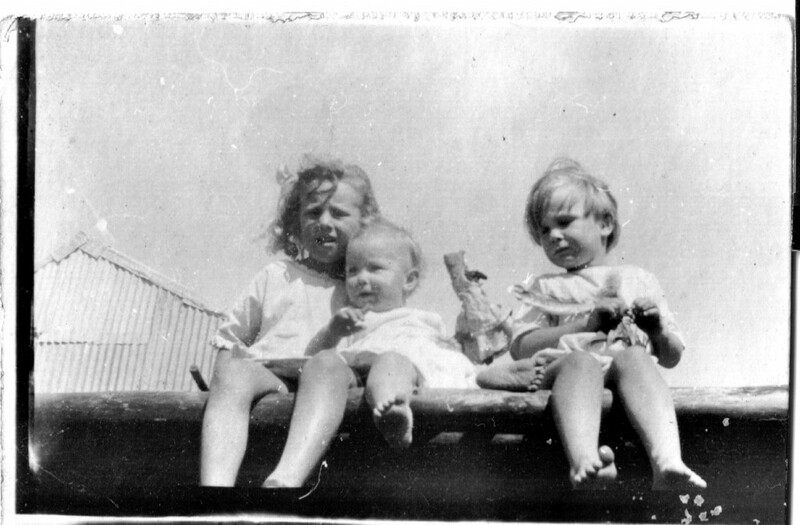 Aunt Thekla must have been made of hospitality, Mother and her 3 (or 4? ), she with 5 children of her own, including some naughty boys who would be whipped with the “zambuk” (the thick leather thong that hung behind the kitchen door, no doubt a relic of the South African war) SHE said, and Uncle Will would never do anything to make them behave, she said. 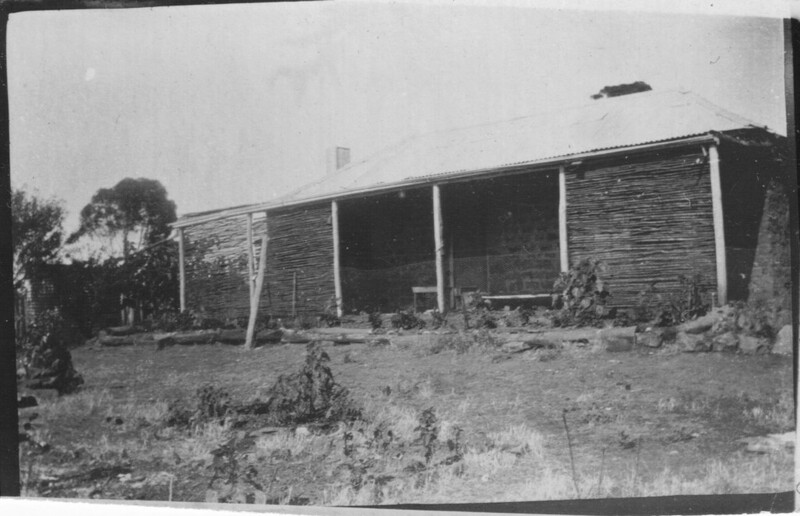 It seems the reason we were at “Carnegie” might have been that Dad was away arranging the purchase of the Kulin farm and the building of the house. Occasionally came guests in the evening. In bed I heard the piano and the singing so beautiful I did not want to go to sleep. Over the years I stayed with Aunt Ida and Uncle Otto, and some of this time I went to school with Miss Fyfe and I loved every moment, the fruit, the warm fire and lamplight and the dear aunt and uncle, no less my cousins. The next memory I have is approaching at dusk the house that Father built, which came to be called “Jesmond”, 20 miles from Kulin town. Of the years we spent there I have recalled much and written of it, which may be changed by anyone who remembers more than I do.